Putranjiva roxburghii belongs to the family Euphorbiaceae (spurge family). It is a moderate sized evergreen tree which grows in moist evergreen forests. This tree has antiinflammatory, anti-oxidant, anti-microbial, anti-nociceptive, anti-pyretic, anti-emetic, cytotoxic, hypoglycemic, larvicidal, cytogenetic toxicity, aphrodisiac, anthelmintic, radioprotective, CNS depressant and analgesic activities, and contains terpenoids, mustard oils, flavonoids, tannins, alkaloids, glycosides and phenolic compounds. 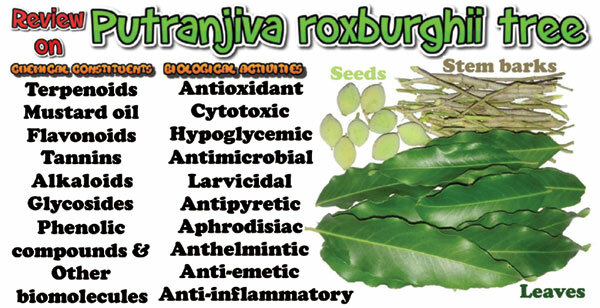 Owing to the diverse biological significance and chemical constituents of Putranjiva roxburghii, this tree is regarded as highly beneficial and useful and further study on this tree is urgently needed. This critical review summarizes the literature dealing with ethnomedical uses, chemical constituents, and pharmacological profile of the leaf, stem bark and seed of putranjiva roxburghii. Particular attention is given to its analgesic, anti-inflammatory, anti-hyperlipidemic, diuretic, hepatoprotective, anthelmintic, and anti-bacterial effects so that its potential uses in pharmaceutics can be better evaluated. We hope that adequate amount of information in this review endorses the importance of this tree and attracts the attention of readers to further explore biological diversity. Putranjiva roxburghii, Refrigerant, Aphrodisiac, Ethnomedical, Analgesic, Antibacterial, Antihyperlipidemic, Anthelmintic.